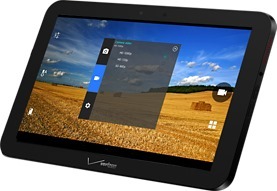 Around this time last year Verizon released a self-branded tablet called the Ellipsis 8, a larger variation on the original 7-inch Ellipsis. We had some fun speculating on its corporate origins. But thanks to lots of discounts and package deals, there are actually a ton of these things in the hands of consumers, including some of my Verizon-using family members. 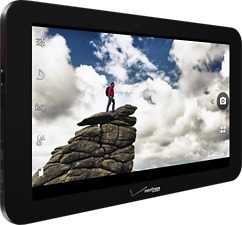 So here we are again, with another, bigger Verizon whitebox tablet. This time it's a ten-inch slate called the (wait for it) Ellipsis 10. The largest member of the Ellipsis family still relies on some middling specs to keeps its price low - $300 off-contract, $200 with a two-year deal, and the usual financing options. All things considered, they're not actually that bad: that 10.1-inch screen is 1920x1200, for example, not the 1280x800 resolution I was expecting. Inside is a 1.5GHz quad-core processor of uncertain origin, 16GB of storage plus a MicroSD card slot, and a sizeable 9100mAh battery. The rear camera is 5MP, but Verizon won't say what the front-facing cam is - it does appear to have one. There's no mention of RAM on Verizon's spec list. The software is Android 5.1, and since Verizon just updated the Ellipsis 8 to 5.1, don't expect that to change any time soon. 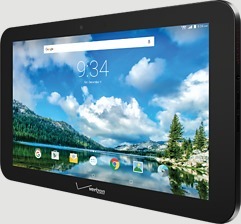 The tablet isn't much of a looker - it's basically just a big hunk of black plastic and logos - but since there's no other 10-inch tablet in Verizon's lineup with a similar price, I expect they'll sell a few. Look for bundles and discounts to appear as the latest round of flagship phones start to lose their luster. NEW YORK, Nov. 12, 2015 /PRNewswire/ -- Looking for a powerful tablet with a stunning display, clear sound and massive battery life? The new Ellipsis® 10 tablet offers an astonishingly crisp and vibrant 10-inch full HD display, the largest capacity battery of any 10-inch tablet on Verizon's 4G LTE network and is available exclusively from Verizon. Whether you are a parent on the go, a gamer, a business power user or simply looking to upgrade to the latest tablet, the Ellipsis 10 has all the features you want in a tablet. Running on the Android 5.1 operating system, the Ellipsis 10 is encased in a beveled-edge design with a soft-touch rear enclosure that is as nice to look at as it is to hold. On the flipside, a 10.1-inch 1920x1200 pixel display lets you experience movies, photos and games in stunning high definition. The gorgeous screen is bolstered with smart amp sound technology and angular firing stereo speakers that boost power and volume for a brilliant audio experience. To help you capture life's important moments and memories, a pair of front- (2MP) and rear-facing (5MP) cameras let you capture photos and 1080p videos. The entire device is encased in an anti-fingerprint coating to help prevent smudges. Going on vacation or travelling for business? With a reliable 4G LTE connection, the Ellipsis 10 lets you stay connected to friends, colleagues and family, and gives you the ability to easily stream and download books, games, movies and more. And don't worry about running out of storage; the built-in 16GB of memory can be expanded up to 32GB via an easily accessible microSD card slot (additional memory sold separately). To help guarantee that these features are available when you need them, the Ellipsis 10 comes with a mega-sized 9100mAh battery that offers up to 25 hours of power (for normal use) - the highest capacity battery of any 10-inch tablet on Verizon's 4G LTE network. The Ellipsis 10 is the perfect addition to the Ellipsis tablet family, which also includes the recently released Ellipsis® Kids tablet. Ellipsis Kids is a full-featured tablet designed specifically for children. It includes content and games curated by education professionals, while allowing parents to customize the experience. Kids love the interactivity, colorful display and fun applications, while parents will appreciate knowing that their children are having fun learning in a kid-friendly environment. The Ellipsis 10 is available exclusively from Verizon for $199.99 with a new two-year activation or $12.49 per month for 24 months (0% APR; full price $299.99). Customers on the Verizon plan can add a tablet to their existing plan for an additional $10 per month (plus taxes and fees). The Verizon plan is available in five sizes (from size S with 1G for $30/month to XXL with 18GB for $100/month) and allows customers to share data across up to 10 devices.